The weather has been scorching hot recently; temperature has climbed to the 90’s this past week or so. These past two days as I was driving around town, the dashboard of my car was showing a temperature of 102F. When the weather is so hot and dry, it strips me off my appetite, especially during lunch time. Going out to eat is probably my last option as I don’t want to get toasted in the car, or being out in the sun. Home-cooked lunch is a better option, something light, healthy, and simple that is not greasy or heavy…then I thought of green tea rice—a simple Japanese rice dish doused in a savory green tea, which is totally refreshing, hearty, and filling on warm summer days. Green tea rice is my comfort food. In Japanese cuisine, this dish is called ochazuke. 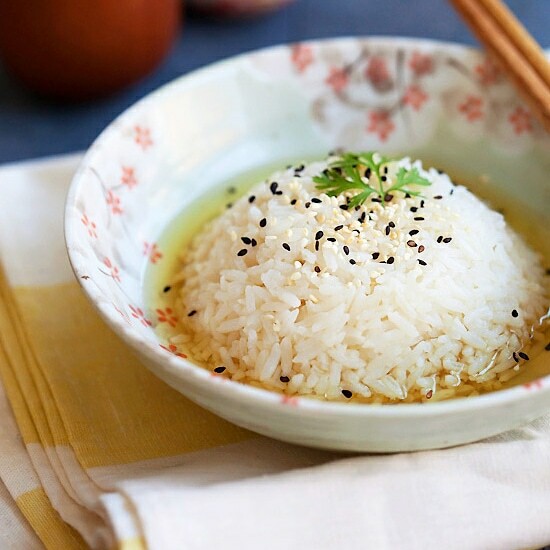 It’s a simple rice dish made by pouring savory hot green tea over steamed rice. 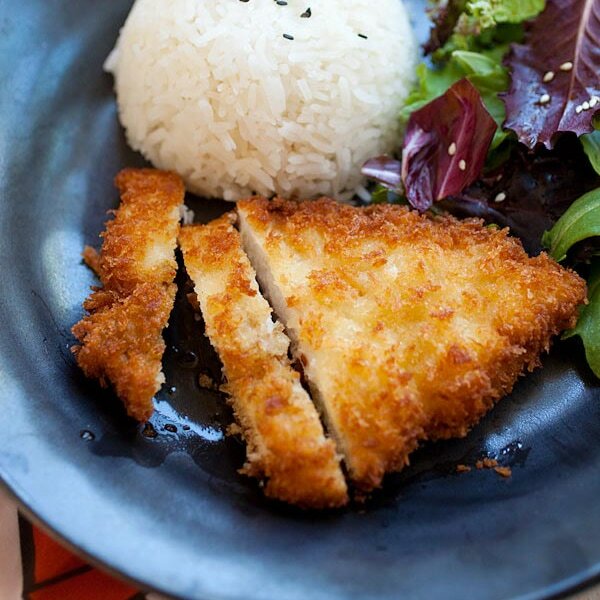 It’s a great way to use leftover rice. Other than green tea, you might add some Japanese dashi to the rice to jazz up the flavor, but for me, a simple, plain, green tea rice is all I need for a light lunch meal. For the green tea, I used Oi Ocha Shincha Green Tea. For centuries, Japan has had its Shincha: the year’s very first harvest of green tea, celebrated for its fresh and lively flavor, naturally sweet finish and smooth umami character. Now, Shincha has been introduced to Americans for the very first time in convenient ready to drink bottles, capturing the season’s most refined flavors, under ITO EN‘s leading Japanese brand of green tea, Oi Ocha. In Japanese, “shin” means new and “cha” means tea. Shincha’s singular character derives from its harvest starting in early April, when young green tea leaves contain naturally higher concentrations of nutrients and vibrant flavors, the result of wintertime dormancy. Fresh Shincha leaves are distinct from latter-harvested green teas, with a subtle sweetness attributed to a higher content of the amino acid L-theanine and a lower caffeine content. The rich and vividly green tea leaves are not only fragrant and fresh in taste, but higher in Vitamin C and catechin antioxidants than regular green tea. What I love about Oi Ocha Shincha is that I can use it to cook, as in this green tea rice recipe, but I can also drink from the bottle as a soothing beverage. I love the sweet and subtle aroma of green tea leaves in Shincha, it’s absolutely soothing and a wonderful thirst quencher during summertime. Oi Ocha’s Shincha is available in 16.9 fl oz. BPA-free, recyclable bottles at select retailers and at http://www.itoen.com in limited quantities. Please stay tuned for a giveaway of Shincha on Rasa Malaysia as a lucky winner will win a case of Oi Ocha Shincha soon. Green Tea Rice using green tea and regular steamed rice. Easy and healthy rice that you can have every day. In a small sauce pan, bring the Shincha (green tea) to simmer, add the salt and turn off the heat. 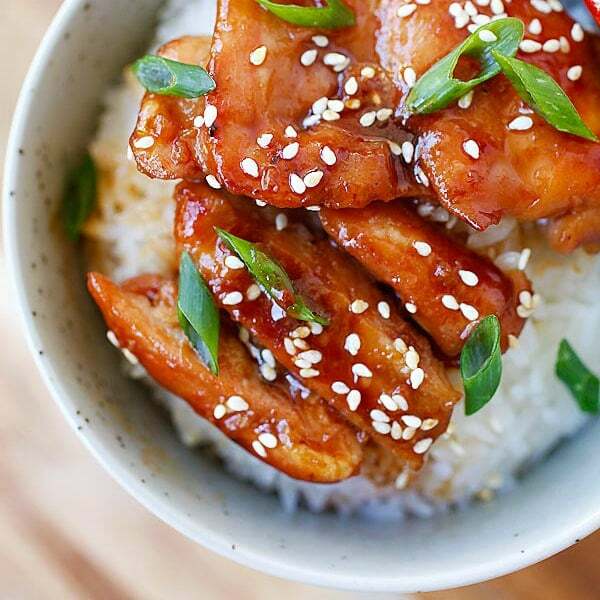 Get a large shallow bowl, put the steamed rice, and add the scallions and sesame seeds on top of the rice. Pour the green tea over the rice and serve immediately. Wow, I wonder what this tastes like! I can almost imagine how refreshing it would be. What a novel recipe! Bee, look at Cooking With Dog’s Tai Chazuke recipe on youtube for a more elaborate preparation. The tai (sea bream) is marinated in a creamy sauce containing sesame and doused in hot tea over the rice, which makes the fish cook just enough. It’s lovely. 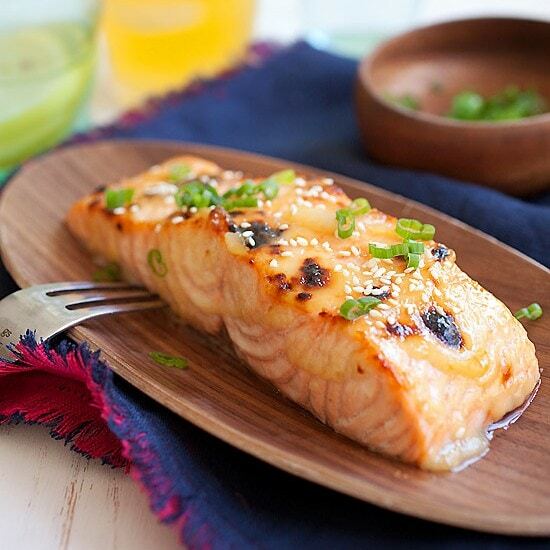 Salted salmon is also really great in this dish. Yes, but you can use leftover rice that’s been reheated in the microwave. i don’t have access to sincha.. will any brewed green tea work? I’ve been enjoying Ocha Zuke for the last 70+ years. Can’t remember when I first had it… I’d guess age 5 or so.